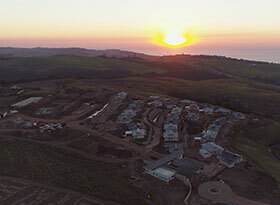 Renishaw Hills estates is situated near Scottburgh, KwaZulu-Natal, midway along the province’s South Coast. Located just 40 minutes from Durban, Renishaw Hills is renowned for its sunny days, cooling sea breezes, breath-taking views and laid-back lifestyle. In order to deliver upon its promise of being the most elegant mature lifestyle village designed for the active over 50s, the estate has to maintain tranquillity and safety for the residents as well as their properties. To this end, it is vital for the estate to have strategically designed and seamlessly executed innovative, state-of-the-art security systems. To achieve this, the estate’s security provider, JNCS Beyond Security, opted for a security system that incorporates AXIS Perimeter Defender. This system alerts guards and site managers of any unwanted activity around the perimeter fence, as soon as it occurs via various communication methods in real time, allowing security staff to become more proactive to potential threats. “We required a proactive system that adds another layer of security and enables our onsite guards to prevent many possible incidents, as opposed to just responding to them after the fact. 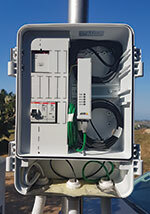 The support we received from Axis Communications before, during, as well as after the completion of the surveillance project was superb,” says Edward van der Linde, MD of JNCS Beyond Security. From within the dedicated control room, the security team is able to monitor the footage all day, every day, with this being provided by various Axis cameras. This includes PTZ (pan-tilt-zoom) cameras that have been strategically placed throughout the perimeter of the estate. 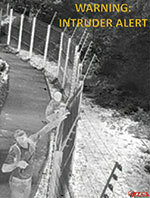 Furthermore, thermal cameras allow any suspicious activities outside of the security fence to be picked up anytime of the day, and within all weather conditions. The footage is stored in a secure, access controlled server room for future use, if needed. According to van der Linde, the AXIS Q1941-E Network Cameras are employed due to the ability of these cameras to ‘see’ in total darkness. This functionality was key, along with the fact that thermal cameras are less prone to attracting unwanted creepy crawlies compared to conventional cameras and their accompanying infrared emitters. By using these units, maintenance costs are also reduced while the total cost of ownership is lower in the long run. In addition, AXIS Q1941-E cameras are being used as these can reliably detect and provide fast verification of the situation, especially during instances of perimeter surveillance. AXIS Q6115 PTZ Network Cameras also form part of the surveillance setup as a result of the high-performing PTZ dome, which offers HD (1080p) picture quality, 30x optical zoom to get up close to subjects without losing detail, and fast and precise pan-tilt performance for wide area coverage and detail when zooming in. Van der Linde states that any system has the potential to be a good system, however, this is solely reliant on the integrator’s training, knowledge and work ethic. Axis Communications has one of the strictest training programmes that JNCS Beyond Security staff have been on and for him, it’s good to know that only authorised personnel are able to work with their solutions and systems. With the current economic climate in South Africa, peace of mind and secure living is of the utmost importance, especially within the context of estates. In order to make this vision a reality, security providers have to partner with the right service providers that can deliver the expertise required to put forward the right and most complete security solutions. “A working relationship with all our suppliers is a major factor in our success and the support from the Axis team has been awesome,” van der Linde concludes. Residents of Renishaw Hills estate are now able to enjoy the peacefulness and splendour of their country-style living, without the constant threat of security-related incidents. The effective security measures has played a role in the value of the properties on the mid-South Coast having increased, on the back of various new infrastructure development projects that are continually added to the area. Furthermore, false alarms caused by animals being attracted by infrared emitters have decreased, thanks to the use of thermal cameras.